Beginning on Thursday June 8 and concluding on Sunday June 18 a four man delegation of Neturei Karta International visited Iran. Their goals were to lessen anti-Jewish sentiment among the Islamic population, bring chizuk to the Jewish community and alleviate the plight of thirteen Iranian Jews charged with espionage. This visit elicited an emotion charged critique, "That Infamous Road Paved With Good Intentions", in the 20 Sivan edition of the Yated Ne'eman. NKI has been denied the opportunity to respond to this article in the Yated. What follows is an attempt to correct the errors of that article and explore some of the underlying issues which it touches on. Much of the discussion to come explores topics that are often subject to more heat than light. It is the author's hope that the reader will approach this work with objectivity and a willingness to examine questions that the dominant forces of our age have long since declared answered. The Yated Ne'eman strives to perform an important function in the Torah community. It allows its readers to keep abreast of developments in the Torah world and the world in general without having recourse to other media sources whose philosophies and standards are antithetical to Torah. In addition, it alerts its readers to assorted forms of heresy or quasi heresy which stalk the Jewish community in this trying period in our people's history. Lastly, it provides inspiration via mussar and tales of the righteous in order to spur us on in G-d's service. It comes as no surprise, historically, that the Yated's editor has served ably to spread the above mentioned messages. It was in the tale end of the nineteenth and early parts of the twentieth century that his ancestor, R. Yaakov ha-Levi Lipschitz (1838 - 1921), was in the forefront in the struggle against assorted heresies in Lithuania. One of the foremost dangers which R. Lipschitz pointed out was Zionism, a new movement at that time, but one which he saw had great potential to do bad. A scholar and writer of renown, he worked together with the likes of R. Chayim Soloveichik of Brisk, R. Eliezer Gordon of Telz, R. Eliyahu Chayim Meisels of Lodz, R. Chayim Ozer Grodzinski of Vilna and the Lubavitcher Rebbe, R. Shalom Dov Ber Schneersohn (may their memories be blessed), to combat the early flowerings of Zionist thinking. It is thus particularly disturbing and painful to note that the Yated frequently evidences a profound lack of understanding as to what Zionism is and what danger it represents. The editorial memory of the Yated seems quite short and, hence, incapable of remembering the very ideals and first principles which motivated the Torah leaders and journalists of a century ago. Our spirit in what follows is not contentious. We respect what the Yated has accomplished in the Jewish community. We hope, with Hashem's help, to offer a bit of respectful reproof. The Yated of 20 Sivan 5760 featured a lengthy article denouncing a group of Jews who traveled recently to Iran on a mission of mercy. The group's aim was to lesson anti-Jewish feeling in Iran and to attempt to achieve some degree of mercy for the thirteen imprisoned Jews accused of espionage. None of these intentions, however, impressed the article's author, Mr. Avi Yishai. His writing was vicious in its uniform criticism of the group. Words were not spared. The trip was "something evil", "malignant", "ill-fated" "doomed" and "bizarre". The writer, Mr. Avi Yishai, leaves little room for doubt in his readers' minds. Although he acknowledges the possibility that the delegation's "intentions were good" the "evil" they worked and "damage" they did can only be erased by "rachmei shomayim." In the title of the article, "That Infamous Road Paved With Good Intentions," we may infer that the delegation is, indeed, headed for eternal punishment. In order to understand the basic assumptions of Mr. Yishai it is necessary to first analyze the traditional Torah approach to Zionism. The past half century has created much confusion in this area and we must have a look at the first principles involved. There were many reasons why the Torah leaders and masses of G-d fearing Jews opposed Zionism down through the decades. In the rush to avow and disavow party grouping and labels some of the most elementary have been forgotten. We will not concern ourselves with the fears Torah Jewry had of Zionists' irreligiosity. Those were, of course, legitimate and have been born out by history. However, the Torah view of Zionism went far deeper than this. It was an opposition to the doctrines of Zionism not merely the actions of Zionists. It was rooted in the belief that Zionism, by advocating a political and, eventually, military end to golus, was violating the Divinely ordained terms of exile. Exile was always viewed by the Jewish people as a punishment for sin. Efforts to escape the state of exile by this worldly strategies are inherently doomed to failure. The only proper means of ending the exile were Torah, prayer and penance. On every yom tov during the Mussaf prayer we recite, "Because of our sins we were exiled from our land. . ." The desire to end this state by recourse to politics or arms is indicative of a lack of faith in the Divine Governance of human affairs. It is for this reason that the Zionist ideology was conceived among non-believers, far removed from their faith. The opposition to Zionism was further concerned that this violation would inevitably lead to conflicts with other nations and (as foretold by Chazal) these struggles would often be quite bloody. Human affairs are forever governed by Divine Providence. In the end, as the Psalmist tells us, "There are many thoughts in the hearts of men but the Counsel of Hashem -- it shall stand." Hence, whether it pursues a path of war or peace the state of Israel is doomed to a never ending agony of violence. Events have validated this sentiment of chazal over the past fifty two years. On the most profound level -- besides destroying the Torah view of golus and leading the Jewish people into fifty two years of war with Arabs and Muslims around the world -- Zionism replaced G-d's service as the central purpose of Jewish existence with a notion of peoplehood divorced from G-d. Thus, the guide map of Jewish conduct, the Torah, would now take second place to the excesses and emotionalism of secular nationalism. Questions concerning life and death matters would be weighed by the secular desires of a land and soil patriotism with little or no concern for halachic standards. Doubtless, the Yated's editor would claim that he is in agreement with all the above. However, as we examine his high tempered denunciation of those who visited Iran it will become painfully obvious that his world view has suffered much, albeit subconsciously, at the hands of an ideology that his ancestors fought so valiantly against. For example, Mr. Yishai asks, "How can Jews present gifts to a sworn enemy who has just called for the annihilation of Israel and all its inhabitants?" We leave for the moment who and what this "sworn enemy" is opposed to. We leave also whether the quotes in question about "annihilating)" Jews are accurate. Let us assume them all to be true. The answer to Mr. Yishai is that by presenting gifts to an "enemy" we are merely following the path laid down by our forefather Yaakov in his approach to Esau the wicked, which serves, according to Chazal, as a model for exilic Jewish conduct. Examples of this approach abound. One of the most famous is that of R. Yochanan ben Zakai who, in order to save the Torah sages, humbly entreated Emperor Vespasian, surely a Jew hater. Indeed, the only standard to be used in assessing whether one should visit a "Jew hater" and bring him gifts is whether or not it can alleviate Jewish suffering. And, we know that in exile this is the proper and most effective tactic. Why then the rage on the part of Mr. Yishai? Why does propitiating an "enemy" bother him so? Is it not because he has absorbed willy-nilly the Zionist notion that it is somehow demeaning for Jews to be humble before their enemies? Has he not, in effect, absorbed the Zionist dogma that the correct response is always to fight - verbally, economically, politically and, if need be, militarily? Continues Mr. Yishai, "The painful truth is that the visit of the delegation was akin to shaking hands with the devil, for a most unworthy cause." But, Mr. Yishai should we not "shake hands with devil" to lessen anti-Jewish sentiment and possibly save Jewish lives? Is there any indication that the demonization and ostracization of Iran since the 1979 revolution has lessened anti-Jewish sentiments in that country? Hasn't the Zionist approach made things far worse? Why are you emotionally linked to the policy of never speaking to an "enemy"? Was that the approach of your illustrious ancestors to the Czarist government? There is, of course, a certain degree of animosity built into the very fabric of group relations as Chazal tell us. Nonetheless, that animosity varies throughout history depending on a host of factors. By and large the record of Arab and Islamic countries throughout the centuries towards their Jewish populations has been far better than those of European lands -- not perfect but far better. The hostility in this century among Moslems is the direct result of Zionism. A careful examination of the attacks and pogroms of the pre-1948 era inevitably reveals that they were in response to Zionists plans and eventual actions to wrest political sovereignty from the Turks or the English by immigration and force of arms. Thus, we have witnessed the fulfillment of that which were foretold by Chazal. A violation of the letter and spirit of exile has led to endless bloodshed and hatred. How better to lesson this hatred than by proclaiming to the world that Zionism and Judaism are not identical? How better to lesson Islamic hatred for all Jews than by telling the Islamic world that Judaism, in fact, condemns Zionism? Let us turn once again to Mr. Yishai. The Iranian government is accused of "implacable hatred for the Jewish nation." Hasn't the editor fallen prey to the foundation stone of Zionist ideology that the Zionists are the Jewish people and that modern Israel is "the Jewish nation"? Among the sins he accused the delegation of is that they functioned as a tool of those who would "deligitimitize Israel", that they explained to the Iranians that "Judaism and Zionism are not synonymous'" and that "Jews have no rights to Israel." Mr. Yishai, do you think that the Brisker Rov, Reb Chaim Ozer, Reb Elchanan, Rav Hirsch and hundreds of others would have legitimized Israel? Would they have wanted the nations of the world to think that the atheistic creed of Zionism was synonymous with Judaism? Would they have claimed pre-Moshiach that the Jewish people have political and military "rights" to the land? What would Rav Hirsch have said had a group of heretical Jews "actively" accelerated that which "is prohibited to us"? And killed tens of thousands of Jews and Gentiles in the process? And were committed to continuing their scheme? And publicly desecrated G-d's name every time they entered the public forum by presenting themselves as the leaders of the Jewish people without acknowledging the G-d of Israel? Hasn't Mr. Yishai been duped into forgetting the cause for the turmoil in the Middle East? Hasn't he forgotten the effects of violating the terms of exile? Hasn't he simply forgotten the history of Jews in Arab lands and how the terrible events of recent decades actually came about? In essence, isn't his reading of history essentially that of Zionism? Indeed. Mr. Yishai quotes in a critical vein an article which appeared in the "Iranian News Agency" (the actual title is Islamic Republic News Agency) describing the views of the delegation as those who "consider the Zionist state of Israel a violation of the basic tenets of Israel" and have "strongly opposed Zionism since the day this satanic cult started taking shape in Europe." What is there to criticize in this portrayal? Doesn't Mr. Yishai see the spilling of Jewish blood over decades in order to establish Jewish political rule over the Holy Land as a "violation of the basic tenets of Judaism"? Wasn't Zionism which "started taking shape in Europe" a movement advanced by Satan? Didn't it destroy tens of thousands of souls? Hasn't it endangered and caused the physical deaths of thousands? Is that not Satanic? Do the Gedolim of Agudas Yisroel disagree with this analysis? Perhaps, what has occurred here is that decades of participating in the affairs of the Zionist state has rendered Mr. Yishai a bit forgetful of these basic notions? Mr. Yishai is very concerned that the delegation to Iran proceeded without sanction of Rabbonim. He accuses the group as "in no way reflect(ing) the ideology of mainstream Yerushalmi Neturei Karta leaders such as the esteemed Rav Aharon Katzenellenbogen zt'l." He further asserts that "this bizarre venture (was) launched without the guidance or blessing of any recognized Rabbinic leader and disavowed by the main body of Neturei Karta in Eretz Yisroel." It is, of course, difficult to respond to the asserted "disavowal" devoid of attribution. Perhaps, the Yated will eventually reveal its source from "Neturei Karta of Eretz Yisroel" for this is the second time in less than a year that this wild accusation has been made without supplying any source. However, the rest of the statement is simply untrue. Both Rav Katzenellenboegn and Rav Amram Blau zt'l were on record as having supported efforts to spread the message that Zionism and Judaism are distinct amongst all peoples and particularly among Islamic peoples. In fact, in a letter cosigned by both Rabbis on the 17th of Iyar in 5731 (1971) they wrote, "Those who are concerned about the Honor of G-d's name should know that the Jewish people has no connection with the Zionist heretics and their state has no connection with am Yisroel. It is proper to give these words the greatest amount of publicity possible that they should be heard throughout the world in every land and among every nation." We are encouraged that the Yated editor does not limit his respect to Agudah leaders. He also regards these earlier Neturei Karta sages as "esteemed" and worthy of citing in order to denounce the current mission of mercy to Iran. We are, thus, happy to inform him of their true convictions. Suerly future editions of the Yated will print a retraction and clarification. Actually, in Jerusalem the newspaper of the Aidah haChareidis, Ha-Aidah, which represents those "moderate" Jerusalem "Neturei Karta" as well as the largest body of anti-Zionist Jews in the Holy Land waxed eloquent in its praise of every aspect of the mission to Iran in its 27 Sivan lead editorial. Similarly HaChomah, organ of Neturei Karta worldwide, has enthusiastically endorsed the trip. Lastly, the trip was undertaken with Rabbinic consultation and support. Among those who supported the trip were HoRav R. Avrohom Leitner, HoRav R. Yecheskel Gold, HoRav R. Yoel Morgenstern, HoRav R. Lazer Chaim Blum, HoRav Simchah Yisroel Blum, HoRav Mayer Yehudah Tannenbaum and many others. We await the Yated's publication of the names of those of "Neturei Karta in Eretz Yisroel" who "disavowed" the pidyon shavuim effort. It is worth noting in passing that Mr. Yishai was working under a double disability in composing his article. First, he failed to contact the participants. Their names were known to him yet he never called them to inquire about the trip. He writes, "Without the benefit of a briefing from the five (four - author) man delegation we are left in the dark regarding the specifics of their intentions with the Iranian authorities." Quite so. But, why, then, did you not inquire? Why did you not attend the press conference held at a Manhattan hotel by the delegation despite having been informed by fax that it was to occur? Two, he deliberately omitted from his report quotations from the same articles of IRNA (Islamic Republic News Agency) which he referenced because they wouldn't fit into the image he was trying to create. In the quote which begins his article Mr. Yishai attributes the following to the "Iranian News Agency": "Hasidic and other Jewish sects have strongly opposed Zionism since the day this Satanic cult started taking root in Europe . . ."
Surprisingly, when reading the actual release we discover that the quote is not from IRNA. It was IRNA quoting the Tehran daily Kayhan International. The latter paper was, in fact, criticizing the error of their own nation's leaders in ignoring anti-Zionist Jews! Here is the quote in full as it appeared in IRNA: "Drawing a distinction between Judaism and Zionism, the paper praised Rabbi David Yisroel Weiss for emphasizing this important point in his talks with Iranian media this week. 'Weiss was not saying anything new,' it pointed out." "In fact, 'he was only repeating certain obvious facts which the Muslim world has been slow to grasp,' it added." 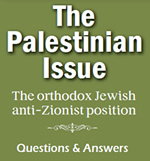 "It moreover shows the 'inability in our political and diplomatic circles to focus on the reality of Hasidic and other Jewish sects which have strongly opposed Zionism since the day this Satanic cult started taking shape etc.,' "
So enthused was Kayhan as reported by IRNA that it hoped that " 'the arrival of the Rabbis in their traditional robes and the headlines they have made should not be relegated to the background as those influenced by the U.S.-Zionist propaganda are trying to do.' "
What was significant in the visit? Kayhan wrote and IRNA reported, "the visit has 'busted the myth that Judaism and Zionism are synonymous with each other.' "
Mr. Yishai actually describes his quotation fragment, extracted from the middle of the IRNA report as follows: "So begins a June 13 report published by the official Iranian news agency . . ."
A simple untruth and a most significant one for it omitted entirely the respect accorded Judaism in both Kayan International and IRNA and their criticism of the Islamic world for not distinguishing between Judaism and Zionism. We find a similar resort to selective quotation by Mr. Yishai in his report of the delegation's visit to the Ayatollah Taskhiri. We will deal with what is accurately quoted later. At present let us present the words of IRNA that the Yated left out. "Expressing satisfaction with the visit made by the intellectual Jewish clerics to Iran, he said that it was his hope that a unifying movement as well as greater cooperation can be achieved for the benefit of mankind. . ."
This statement was of no significance to Mr. Yishai. Nor was the following: "He told the visiting guests that their movement is a noble and a sacred one which can open doors to greater understanding between the two religions." Indeed the Ayatollah's exact words appeared twice in the article. Mr. Yishai chose one and ignored the other. The latter read: " 'Judaism is a divine religion and its teachings are divine,' remarked the Ayatollah, adding that the numerous crimes of Zionism have distorted the image of Judaism." Of course, offering the Yated readers these quotes would have made for a more complicated and nuanced article and wouldn't have fit the image of Iranian "bottomless cruelty and irrational hatred' of Mr. Yishai's imagination. Or, is the imagination Mr. Yishai's? Is he not actually parroting the cliches and stereotypes that Zionism has advanced for the last century instead of examining the facts? The fundamental thesis of Mr. Yishai's attack is that the delegation's presence in Iran made things worse for Iranian Jewry and also endangered Jews living in Eretz Yisroel. It "severely heightened the danger for the Iranian Jewish community" and it encouraged the Iranians in a "fundamental Islamic article of faith that Jews have no right to Israel." Further it "forment(ed) more of what the Iranians regime is so adept at -- implacable hatred of the Jewish nation." First, the minor inaccuracies: 1) There is no "fundamental Islamic article of faith" which governs contemporary geopolitics in the Middle East. Clearly, unlike the stereotypes of Mr. Yishai's creation, there is much disagreement among Muslims throughout the world on this matter. We would be most interested in the Yated's source for this bit of information on Islamic theology. 2) Does the Iranian government have a "hatred for the Jewish nation"? Or has the Yated once again fallen into mouthing the fundamental article of Zionist faith, that the state of Israel and the Jewish nation are one and the same?!? As regards the vital question of the effect the trip had on Iran's Jews, Mr. Yishai is once again operating from the self imposed disadvantage of failing to pick up the telephone and call those who were there. In the first place the group were frequent visitors in the synagogues of the country. These were always highlighted by a talk given by one of the guests given to the Jews who invariably flocked to the shuls. The subject matter was the same -- basic Judaism, Sinai, Torah and mitzvos, Shabbos, kashrus and the like. Everywhere the people couldn't get enough of their esteemed guests. Specifically, on the morning of Thursday June 8th they davened at the Abrishami Synagogue in Tehran which filled to overflowing in honor of their visit. After shacharis a member of the delegation addressed the masses assembled. Thereafter they visited and spoke freely with the Jews at Tehran's Jewish Community Center and were shown by their Jewish hosts the library and computer center. In the afternoon they toured the Dr. Sapir Jewish hospital and spent time with the patients, Jewish and non-Jewish. Late afternoon found them at a conference with Rabbi Yousef Hamedani, Chief Rabbi of Tehran, where they discussed at length matters of halacha, world and Iranian politics. On Shavous night (Thursday the 8th) they davened at the Pesyan synagogue in Tehran and spoke afterwards to the tsibur. Including questions and answers after the talk this event took over four hours. Once again on Shabbos they spoke in the Pesyan Shul. The following week they visited Isfahan City, where they prayed with the tsibur, spoke to a full and enthusiastic shul and went to the community mikveh. Lastly, on their final motzei Shabos of the two week tripin they visited at the Pesyan synagogue where a gala farewell was prepared for them. They spoke yet again and the Iranian Jews entertained them with having many of their children recite their recent selections from Chumash, Ani Maamin and aseres ha-dibros. This last event which began at midnight was attended by over six hundred Jews. Besides these religious visits and talks the group also met at length with the Iranian Jewish members of Parliament, assorted communal and student leaders with whom they had wide ranging discussions concerning the spiritual and material situation of the nation's Jews. At no time did the government tell the delegation what to speak to the Jewish community about. Their remarks, all of which emphasized the need to maintain loyalty to the Torah, were allowed and encouraged by the government. There was no censorship either before or after the delivery. This writer has seen video tapes of all the non-Shabbos visits and can verify that the visitors brought the message of Torah to thousands of Jews eager to hear it. Only the most preconceived spirit of resentment could judge this unprecedented kiruv mission as in some way endangering Iranian Jews. The entire visit was an enormous source of chizuk emunah for thousands. Mr. Yishai, of course, knew none of this and evidenced no interest in finding it out. To him "what we do know (about the trip) is enough." And, what precisely did he know? "We know that the unfortunate visit took place, and that it was pounced on and exploited by the Iranian propaganda machine." Here we arrive at the heart of the Yated critique. Even if Mr. Yishai now knows that the trip was a great source of chizuk for Iran's Jews and that it in no way endangered that community he would still maintain that it was bad because it endangered Jews living in Eretz Yisroel. Let us analyze this proposition. There is little doubt that the overall effect of the visit on Iranian attitude to towards Judaism and Jews was positive. The delegation pointed out that the aspect of "Jewish" behavior which has alienated the Iranians over recent decades, namely, the actions of the state of Israel are not those of Jews loyal to G-d and Torah. They welcomed this message and proclaimed that there was and is no quarrel between Islam the religion and Iran the state with the Jewish people. Let us imagine for a moment that a large group of non-believing Jews elsewhere in the world was fighting needlessly with a non-Jewish people. This, in turn, had led to animosity and violence directed at all Jews, not just those responsible for the trouble. Wouldn't Mr. Yishai grant that it is a high priority to inform that nation that the real Torah people have no quarrel with them and that the negative acts are those of a group pledged to anti-Torah values. Why shouldn't non-Jews identify Jews and Judaism with the peaceful and G-d fearing non-Zionists? Will this heighten or lessen anti-Jewish thoughts? In Iran, at least, it clearly lessened them. Dozens of Islamic groups visited with the delegation. They spoke repeatedly to the media, at two Universitys and with many government and religious leaders. Everywhere the response was the same. "It is an honor that you are here." "We are longing for dialogue with Jews." "Our quarrel is merely with Zionism." "We respect the Jewish faith." Now, it is true that the Iranian government and most of its people would like to see the end of the state of Israel. It is false, though, that they advocate "the annihilation of Israel and (italics in the original) all its inhabitants." In 1948 some leaders of Agudas Yisroel believed that participation in the Israeli government would allow them to best serve the interests of the Jewish people. They had no illusions about the appropriateness of taking arms without Divine sanction, to kill and be killed. And, what has been the record of 52 years of the state which the Yated equates with the Jewish people? A perpetual war, never ending terror in the Holy Land and around the world and an inability to ever make peace have all resulted. This is the record of Zionism materially -- a failed enterprise if there ever was one. Is there a land in the world today where Jews fear for their lives as they do in the Holy Land? All this need not surprise anyone for it is the inevitable result of abandoning the spiritual tasks of exile. We, of course, make no mention of the thousands lured away from Judaism due to this "faith." What policy would the delegates and anti-Zionists Jews advocate toward the state? There is nothing that is original in their approach. They would emphasize that we must go about the proper fulfillment of exilic task by sanctifying Hashem's Name as we serve Him, that we inform Jews and non-Jew that deniers of G-d cannot speak in the name of the Torah nation and that the hatreds, wars and secularization caused by the Israeli state are simply a bizarre distortion of Judaism. They advocate that the state be dismantled. Of course, this does not seem possible in the foreseeable future. Nonetheless, they pray that it should happen and that no innocents be hurt in the process. In the hands of G-d even this seemingly difficult task is possible. Because of their efforts in Iran a nation of some sixty million now sees Judaism in a new light and no longer has a monolithic hatred of world Jewry. The Iranian government also welcomes an end to the Israeli state. Here, at least, the Yated correctly quoted Ayatollah Taskhiri who predicted the "annihilation" (actually a parahrase) of Israel. However, it is clear that he was not calling for the annihilation of all those living there at present. "Annihilation" politically. Yes, the Iranians support those engaged in the military struggle as well. Does this represent a danger? Obviously. The key question, though, is how best to mitigate it? Let us ask Mr. Yishai whether anything he or anyone else has done by way of supporting Israel and identifying that government's deeds and very existence with the beliefs of world wide Jewry has increased Jewish safety in the Holy Land? Hasn't this policy truly endangered the Land's inhabitant and Jews elsewhere as well. Logically if one used to view all Jews living in Eretz Yisroel as Zionists and therefore bad and then discovered that hundreds of thousands of them are actually anti-Zionist would this realization make you more or less apt to hate them as a monolith? Would it make one more or less apt to engage it or support across the board military action? Surely the point is, at very least, debatable? Mr. Yishai has chosen to link our fate to the ideas and actions of the Shamirs and Baraks of the world. May we not opt out of his alliance without being doomed to hell? There was one point in Mr. Yishai's article where he accurately reported what had appeared in IRNA and was justly angered by it. However, here IRNA misquoted Rabbi Weiss and in a later story retracted their original report. The first report claimed that the Rabbi had said "any punishment in the conviction of the 13 Iranian Jews . . . will deter the gullible from falling pray to the Israeli bait. . ."
In truth, Weiss never made that statement which implied that the 13 were guilty. What he did say was a well thought out statement on the matter of the trial which was a plea for mercy. He also submitted a lengthy staement to the Judge, the Iranian President Khatami and the Ayatollah Khameni in order to achieve this goal. It is inconceivable that Mr. Yishai actually believed that Rabbi Weiss welcomed convictions and punishments. Of course, if he had read the Iranian press after his original article he would have seen the retraction. Alternatively, he could have picked up the phone and called Rabbi Weiss. Yet, he chose to do neither. The inevitable conclusion is that Mr. Yishai has forgotten some the holy traditions of the Gedolei Lita and their passionate opposition to Zionism. He has, unwittingly adopted some of the basic assumptions of Zionist ideology. He has subconsciously absorbed these teachings to the point where he is incapable of understanding or even tolerating the traditional view. In his zeal to promote his ideology he denies his adversary the courtesy of a call and allows sloppiness and omission to color his reporting. When the Yated was contacted by phone on some of the above distortions and a request was made for the ability to reply this was refused by the paper's editor. It is for this reason that we have chosen this pamphlet as a means of reply. However, unlike Mr. Yishai we are not so bold as to suggest the whereabouts of his neshomah after it leaves this mortal realm (after 120 years). In fact, we wish him well then and in this world as well. In fact, we are confident that in the future the Yated will adequately reflect the mesorah of Lita, the pursuit of truth, the spirit of fairness and the centrality of Torah in all its writings. We were called upon by the Creator at Sinai to function as "a kingdon of priests and a holy nation." Part of our task as a people is to serve as a "light unto the nations." This involves centering our actions and thoughts on G-d's service via Torah study, prayer and kind deeds. This imperative demands that we practice scrupulous honesty, exemplary manners, embracing compassion and modesty in all our affairs. We are to live first and foremost as "a people alone." Yet, our lives will inspire others and glorify the Name of Hashem if we live up to the Torah's standards.. Similarly our excursions into the public realm should be to emphasize the G-d centeredness of all human endeavor and the need to judge policies by the standards of Eternal Law. We are ill suited for the role of perpetual antagonist in the Middle East. The flowering of religion in the Islamic world is a challenge to a desacralized West. We should be in a position to offer a conditional welcome to the former and a grounded critique to the latter. Due to Zionism many in the Torah community can do neither. Modesty, honesty, prayer and Torah are our agenda -forever striving for awareness of and closeness to the Creator is its purpose. There is no room in this, the true agenda of the Jew, for endless violent struggles with Palestinians, for shrill demands for reparations from all European lands, for support of politicians who advocate the tidal wave of immorality which inundates Western lands simply because they are pro-Zionist or offer large sums of government money. The call of "Kedoshim tihyu" demands an very different orientation. In Iran there was a glimpse of this alternative path. The delegation visiting and comforting the sick of all faiths was a view of something better than that of soldiers ruthlessly policing Gaza. The sense that Orthodox faith may serve as a basis for a common critique of modernity was a view of something better than Jew and Moslem forever at war. The faces of the hundreds of Jews who crowded the shuls to hear of their Torah heritage was a window to somethng better than that of Orthodox political partys groveling and jockeying for monies dispensed by heretics. The Iranian trip was something better than Torah Jews hitching their wagons to the failed Zionist enterprise. Mr. Yishai, do you hear us? VIEW PICTURES FROM THE HISTORIC MISSION TO IRAN!